[CZ] Geocache je umistena na placenem turistickem okruhu v Adrspasskem skalnim meste. Pamatujte na to, ze jste v prirodni rezervaci a take na to, ze je tu casto prelidneno. [EN] This Geocache is hiden on the paid round trail for the tourist in the Adrspach Rocks. There are a lot of people at the final location! The best time for looking for the cache is an early morning or in the evening. Adrspasske skaly jsou povestne svou vyskou, hladkosti a vertikalni puklinatosti. Horolezecke vystupove cesty zde vedou proto nejcasteji sparami a kominy, ktere jsou fyzicky i technicky velmi narocne. Oblast Adrspasskych skal je hojne navstevovana a horolezci vyhledavana. Prvnimi horolezci, kteri v Adrspasskych skalach podnikli vystupy, byli clenove saskeho klubu K.V.L?ssnitz. Lakaly je vysoke skaly okolo hlavni obchuzky, ale nemeli penize na vstupne (za 1 korunu tehdy zaplatili 1630 marek). Skupina deviti lezcu veden? Willi Adamem proto vystoupila .. (A) . kvetna 1923 na Krale (lež? mimo turistick? okruh). Do zacatku druhe svetove valky bylo slezeno okolo 40. vezi a vetsinu vystupu uskutecnili sasti a sudetsti lezci. Vyjimkou byl zajezd clenu Klubu ceskych alpinistu v roce .... (B) . Pred valkou zacinaji v Adrspassko-teplickych skalach lezt take mistni lezci z Teplic nad Metuji a Dolniho Adrspachu. V roce 1941 mel jejich spolek "Kletter Klub Einheimischen" patnact clenu z nichz patril k nejaktivnejš?m Herbert Fichtner. 20. srpna 1944 prich?zeji do Adrspachu na zvlastni propustku poprve clenove nachodskeho horolezeckeho oddilu. Maji za sebou radu prvovystupu na Ostasi, jedine skalni oblasti, ktera nebyla zabrana Nemeckem. V prvnich povalecnych letech jiz k vypravam doskal nebylo treba zvlastnich povoleni, Adrspassko-teplicke skaly se staly opet soucasti Ceskoslovenska. Za zminku stoji prvovystup na Elisku z roku .... (C) (Vladimir Skaroupka, Miloslav Jirka a Miroslav Tomek). V roce 1960 prijizdeji opet do Adrspachu sasti lezci v cele s Herbertem Richterem. Nova ceska generace 50. a 60. let se skupinou mladych mistnich lezcu se pousti do obtiznych spar a vytycuje nove stenove vystupy. Nejvetsi jmeno si svymi prvovystupy ziskal Karel Hauschke (Koksa). Dalsim z talentovanych lezcu byl Jaroslav Krecbach, ktery ve veku 24 let zemrel pod Huascaranem jako ucastnik Ceskoslovenske horolezecke expedice Peru 1970. (Kolik clenu behem teto expedice celkem zemrelo? = .. D). 60. a 70. leta zaznamenala nejvetsi vzestup lezen?. V Adrspachu se od roku 1966 konaly horolezecke srazy. Pocet jejich ucastniku kazdym rokem vzrustal (z puvodnich 200 az na 2000 o deset let pozdeji) zejmena diky vydani publikace Defile skalnich vezi (Karel Smid, 1966). Tento horolezecky pruvodce priblizil oblast Adrspasskych skal lezcum z cele republiky. V teto dobe bylo pokoreno velke mnozstvi skal spoustou vybornych lezcu. A zejmena v 70. letech byly skaly jistym unikem od reality a tvrdosti rezimu. Vybaveni lezcu nebylo temer zadne, nebyly slabe smycky, duralove karabiny, sedaky, lezecky, .... (E = pomucka ke slanovani symbolizujici cislo) atd. Lana byla pouze jednopadova, kruhy stenove i slanovaci se nedali sehnat. Vetsinou si je lezci vyrabeli sami a rozmysleli si, kolik jich na cestu daji. V poslednich letech uz prvovystupy prestaly byt vyhradni zalezitosti mistnich horolezcu, kteri v Ardspachu stravili veskery volny cas. Novi lezci s sebou prinaseji ponekud jiny pohled na lezeni, obtiznost splha stale vys a vys. Zjistena cisla A B C D E ciferujte, dosadte do sudoku a resenim zjistite F G H I .
Nemusite nikde hrabat. Cache je primo na ceste! Doporucujeme odlov brzy rano nebo vecer. Na miste nejsou turiste, vychutnate si krasnou prochazku liduprazdnymi skalami. Kes je soucasti serie. Opiste si cislo pod vickem, treba se vam bude hodit. ale vse najdete i na internetu. 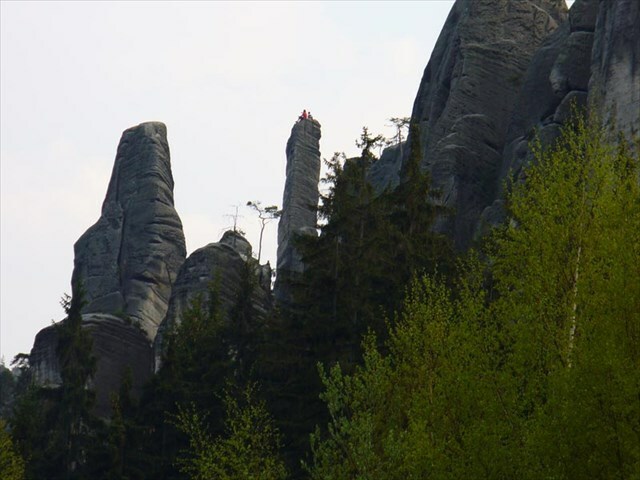 The Adrspach Rocks are known for their height, smoothness and vertical cracks. 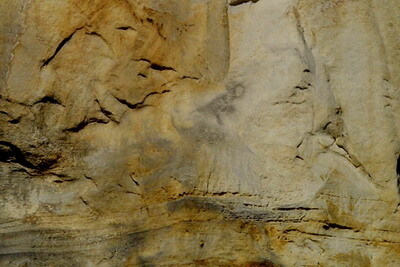 Climbing routes lead most often through cracks and chimneys, which are physically and technically very demanding. The first climbers to have made ascents in this area were members of the Saxon climbing club named after K. V. L?ssnitz. On May … (date A) 1923 a group of nine climbers led by Willi Adam climbed the King Spire. 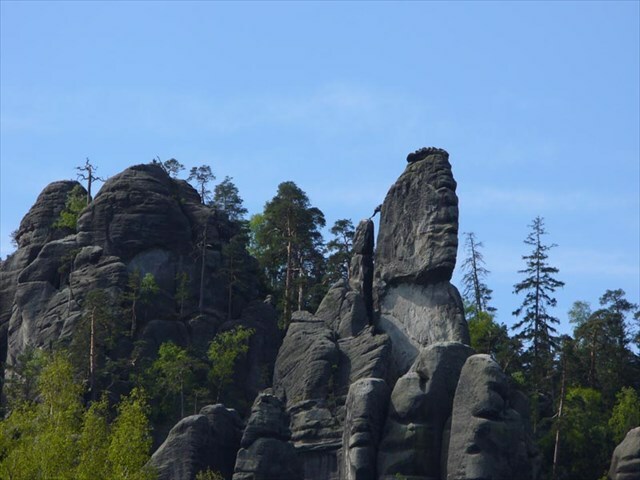 Until the beginning of the Second World War, most climbs had been made by Saxon and Sudeten climbers. The only czech exception was an expedition organized by members of the Czech Alpinist Club in …. (year B). Before the war also local climbers from Teplice nad Metuji and Dolni Adrspach started to climb in this area. In 1941, the "Kletter Klub Einheimischen" (their climbing club) based in Adrspach had had 15 members. The most active of them was Herbert Fichtner. Provided with a special permit members of the Nachod Climbing Club arrived in Adrspach for the first time on May 20, 1944. They had already made a series of original ascents at the Ostas area the only rock area that had not been occupied by Germany. Shortly after the war, the permission duty was cancelled and the rocks became part of Czechoslovakia again. Other ascent that is worth mentioning is the original ascent of the Eliska's Spire made in …. (year C) by Vladimir Skaroupka, Miloslav Jirka and Miroslav Tomek. 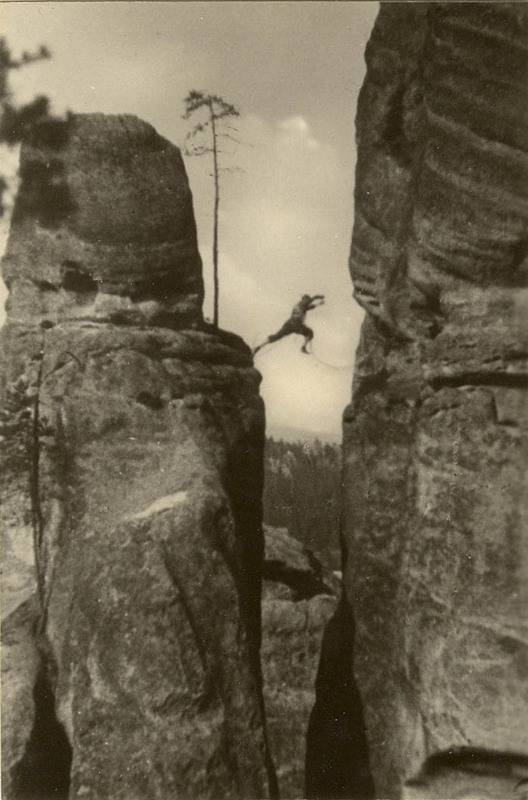 Leading by Herbert Richter Saxon climbers came to the Adrspach Rocks again in 1960. New generation of climbers of the fifties and sixties together with a group of young local climbers threw themselves into climbing very demanding cracks and marking up new routes. One of them was Karel Hauschke (nicknamed "Koksa") who became famous by his original ascents at difficult never-climbed walls in Adrspach. The sixties and seventies were the golden age of rock climbing in the area. While the first of the climber's rallies held in 1966 was attended by some 200 climbers, the rallies organized ten years later were attended by approximately 2000 climbers from all parts of the country. 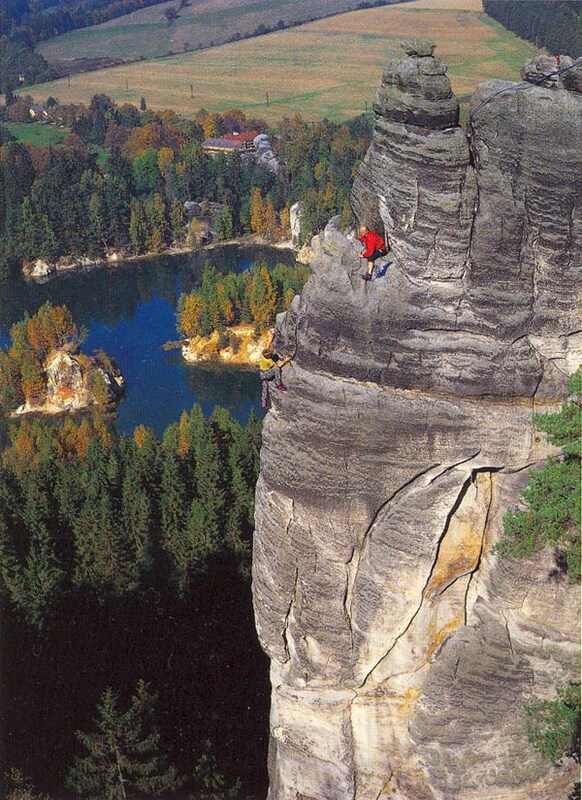 The Adrspach Rocks has always been deemed to be a crack climbers' domain. But there was hardly any climbing equipment in the Czechoslovakia. Climbers had no thin loops, duralcarabiners, harnesses, descenders (which No. resembles this equipment E), ropes were only single-falling etc. Making ascents is not exclusive thing of the local climbers who spent all leasure time in Adrspach in last years. New climbers bring rather different look on climbing and the difficulty grows still up. 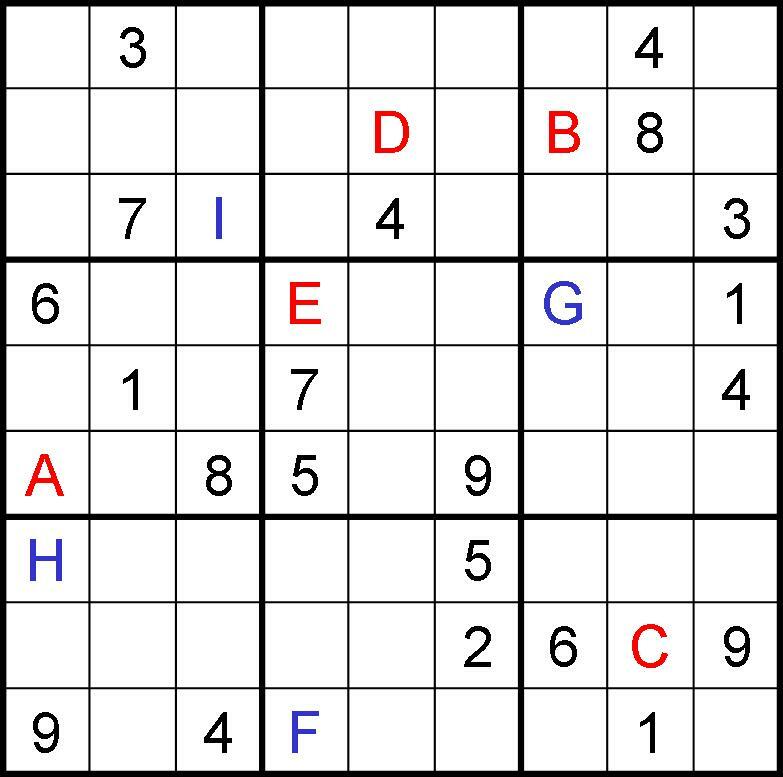 Calculatethe crossfeet of detected numbers A B C D E , enter to the sudoku and find out solutions of F G H I . Bear in mind you are in a natural reservation. Don’t go out of the marked tourist paths! This cache is part of a series. Write down the number on the cap, it might be useful.